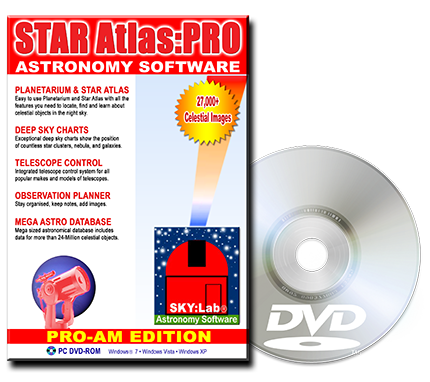 STAR Atlas:PRO™ includes a vast collection of Popular & Historical Astronomical Catalogues which contain precision information about objects in the night sky. These catalogues include data about Stars, Planets, Star Clusters, Nebula, Galaxies and many more types of objects including Comets and Asteroids. Catalogues of Deep Sky Objects. These astronomical catalogues describe deep sky objects such as Nebulae, Star Clusters, Galaxies, Planetary Nebula, Clusters of Galaxies and many other types of deep sky objects. NGC & IC Catalogues. Popular catalogues of 13,300 Nebulae, Planetary Nebula, Star Clusters, Globular Clusters, Galaxies, asterisms and other types of Deep Sky Objects. Messier objects. All Messier Objects. Popular Deep Sky objects. Beehive Cluster, Andromeda Galaxy, Helix Nebula and all other popular deep sky objects. Abell Rich Clusters of Galaxies. (including both the North & South Abell catalogues). This catalogue includes 5,250 Rich Clusters of Galaxies spread over the North and South Hemispheres. Each Galaxy Cluster has at least 30 individual member galaxies. The Caldwell Catalogue. The popular Caldwell catalogue of bright deep sky objects. Barnard's Catalogue of Dark Objects. Barnard's catalogue of 349 dark objects. Hickson's Compact Groups of Galaxies. Extensive data for each individual galaxy group. Strasbourg-ESO Planetary Nebulae. over 1,143 planetary nebulae. Globular Star Clusters in the Milky Way. 147 Globular Star Clusters in the Milky Way galaxy. Supernovae Remnants. All known Galactic supernova remnants. Star Clusters & Associations. An additional 1,000 fainter and small Star Clusters. Quasars and Galaxies with Active Galactic Nuclei. over 11,000 Quasars and more than 3,000 Galaxies with Active Nuclei. Extensive database of numerous galaxy catalogues includes more than 100,000 Galaxies, each with detailed information. The galaxy database includes the following masterful collection of galaxy catalogues. Astronomical Catalogues that describe stars including Variable and Double stars. Bright Star Catalogue over than 9,100 entries with notes for each Star. Hipparcos Catalogue catalogue with extensive high-precision data of the brightest 118,218 Stars. Hipparcos Periodic Variable Stars Over 2,700 Periodic Variable Stars. Hipparcos Un-Solved Variable Stars Over 5,500 Un-solved Variable Stars. Tycho Stellar Catalogue precision data for 1,058,332 (1-million+) Stars including spectral colour information for each star. Tycho 2 Stellar Catalogue more precise data for 2,430,468 (2.3-million+) Stars include proper motions. Guide Star Catalogue 1.1 (GSC-ACT). revised edition of the original GSC with increased position accuracy. The number of unique objects in the GSC is 15,368,650 Stars and 3,299,391 Non-Stellar Objects (non-stars), totalling 18,668,041 unique objects. *The Guide Star Catalogue (GSC) catalogue provides multiple entries for some objects. The number of unique objects found in the GSC is 15,368,650 Stars and 3,299,391 Non-Stellar Objects (non-stars), totalling 18,668,041 unique objects.